Mindmap, mindmap, why do I forget thee? This time, I added some information about Activity theory and Spinuzzi’s main concepts of centripetal and centrifugal forces in communication; designer-as-hero/user-as-victim; and macro/meso/microscopic. 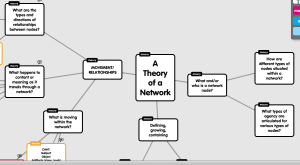 I spent time asking questions on the Popplet, so I see these as temporary Popples, a place to park my thinking as I try to connect the various theorists together. It seems to me that there are moments of unity that converge around an object, and that various theorists call this by different names. There also seem to be tensions that create the structures, which would not exist without the tension. A genre (or a manual, or an SOP, etc.) seems to be like the “skin” on the top of a glass of water. Transparent, existing but not always seen or thought of, a boundary that is crossed seamlessly in order to enact or demonstrate an action. I’m also beginning to think that Bitzer-esque desires to categorize and create genres is an impulse of most rhetoricians, and that the creation of such theories and “boxes” and “structures” is necessary to generate the discipline. It’s about creating boundaries and staking claims. Lastly, I made a big Popple called Deviance, because I think that this is going to be even more important and a place of convergence, but I’m not sure how yet. If my Popplett below doesn’t show up as a functioning Flash object, please click on these words or the image to visit the Popplett. 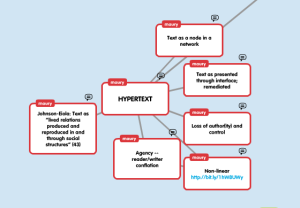 This week I just added a node of key terms from the How Stuff Works readings related to Genre Theory. As I was reading Bazerman, Popham, and Miller, I kept coming back to the concept of the Router and the packets of information that travel along the network. I kept thinking of the genre as functioning as the router — sitting BETWEEN two nodes OR between two networks. Routers have this function of regulating and translating. Routers that sit between networks “speak” the protocols (rules) of the networks that connect to it, even if the protocols for a particular network are discrete. That made me think of the distinction Miller makes between the two types of rules — constitutive and regulative — each governing a discourse community or member of the rhetorical transaction. Routers would translate and mediate between those two sets of rules, making them parallel and “talk” to each other. Without the Router — you’ve got miscommunication, malfunction, a Tower of Babel. I also started thinking then of routers as genres as boundary objects. Genres sitting at the edges, like Popham says, of two different networks or nodes. A router is clearly a boundary object; it is in the liminal space between, it is the knitter of the interstitial spaces. It is what allows discourse. I think thought of genres as allowing discourse, as controlling and regulating it, discourse as not existing — or functioning — without them. Genres then, are sites of dynamism, not distinct entities that circumscribe into a unity. Genres are embodiments of discourse, housing the activity that creates it. A genre then functions not a container to “house” but as a sieve to flow through. I’ll have to try to draw that. Popplett is not the proper tool. I spent some time, Spinuzzi-style, trying to make Popplet do what I, as the user, wanted it to do. I am going to try to make nested Popplets next week, in an attempt to show networks within networks and more complex systems than 2-D linear ones.